Lately we have been inundated with CALVES!!! It’s like all the Mommas new it was Thanksgiving week, a huge cold icy rain storm was going to be sticking with us for a few days and the kids were home from school majority of the week and lets have those babies!!! You know the saying…”When it rains, it pours”, well here “it rained, and it poured calves”! In the bigger picture I know calving is a good thing, it means more cows we get to add to the milk string and either bull calves to sell or more heifers to add to the program, so it’s a win all around. AND lets be honest, I am use to a big calf operation, so when we have less than 30 on bottle it’s a breeze! 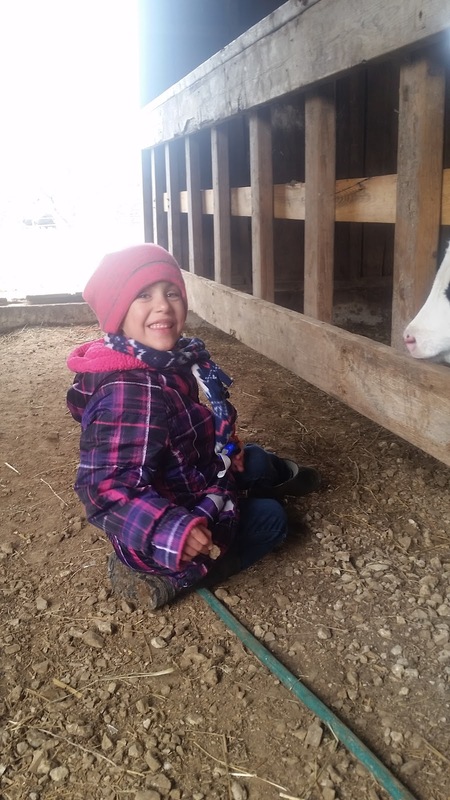 Here are a few pictures a snapped within the past week of the kids helping me with calf chores. 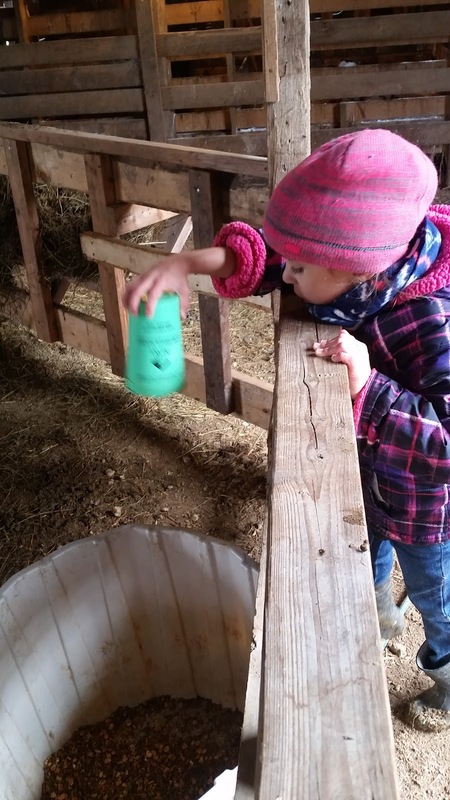 Lets first state that Madison loves helping me with graining and watering the calves. Which is no surprise because she loves animals and loves to feed them! 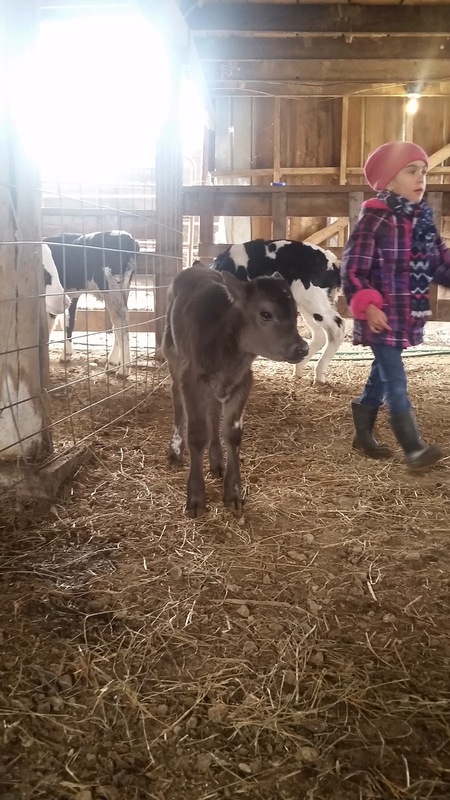 This little grey calf is Madison’s and Bryce’s favorite. It’s a mix of Jersey, Holstein and Angus and she was out of a first calf heifer, her Mom was a Jersey-Holstein cross. This little guy loved Madison…she kept trying to get it to lick a rock, haha, except it quickly figured out it wasn’t a bottle of milk! When we took this “calf-barn-selfie” Bryce thought it would be funny to make it look like he was picking my nose, haha…oh you know…a 9 year old boy and his humor! Once I get my 9 year old to stop arguing with me (lord help me, LOL) and to help me with feeding the milk bottles, he is an excellent help! I don’t have to tell him what to do or how to feed, he know exactly what to do and I am not surprised because he has literally grown up around the calf crates. From stroller, to playing tractors, to driving his power wheels up and down following me, and then to helping me as he got older, he knows calves! 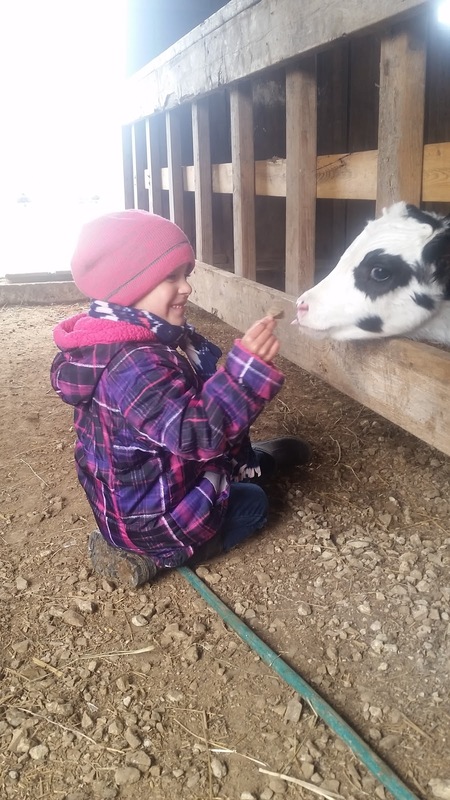 Kids make the perfect helping hand when it comes to calves!